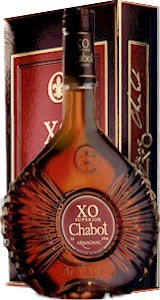 Cognac Brandy by Chabot of Cognac, Brandy. . The Chabot family established their repute in the wines and spirits trade circa 1828. . Armagnac is distilled in much lesser quantities and by much smaller producers than neighbouring Cognac, achieving a finer, more complex, oak influenced spirit.